This entry was posted in English, Ukraine on May 29, 2010 by FEMEN. This entry was posted in Ukraine, Ukrainian and tagged kyiv, ministry of education on November 16, 2009 by FEMEN. This entry was posted in Ukraine, Ukrainian on July 30, 2009 by FEMEN. This entry was posted in Ukraine, Ukrainian on July 29, 2009 by FEMEN. 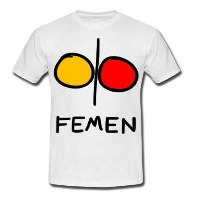 This entry was posted in English, Ukraine and tagged kyiv on June 12, 2009 by FEMEN.